The Mountain Yoga Pose is a great way to learn proper posture, alignment, and balance, and to develop strength in all the muscles needed for upright yoga positions. But we'll admit it kind of just looks like standing. Performing the tada-asana allows one to observe one's posture closely and clearly recognize those problems which get masked or ignored by day-to-day activities. As the posture is held and the breath, mind, and body is quieted various effects will surface to indicate difficulties with the spine. 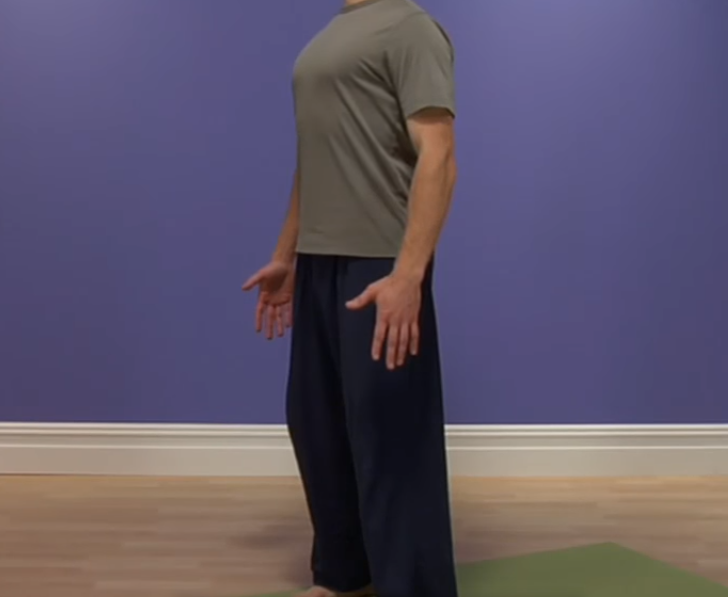 Favoring one foot over the other, shifting back and forth, drooped shoulders, tightness in the neck and upper or lower back, and various other physiological disturbances may appear indicating the need for further yoga practice. A correctly executed Tadasana will use every muscle in the body. It improves posture and, when practiced regularly, can help reduce back pain. This pose strengthens the thighs, knees, ankles, abdomen, and buttocks. It is also helpful for relieving sciatica and for reducing the effects of flat feet. Slightly tighten or flex the muscles in the knees, thighs, stomach, and buttocks maintaining a firm posture. The balance you weight evenly on both feet. Duration/Repetitions: One repetition for several minutes is advisable. The tada-asana is also recommended prior to and following any other standing posture. Beginner's Tip: You can improve your balance in this pose by standing with your inner feet slightly apart, anywhere from 3 to 5 inches.